Increasingly, patients who find it necessary to receive dentures are choosing the implant retained removable overdenture. For denture wearing patients, this system offers substantially more comfort than pressure or adhesive retained dentures. At Dental Implant Center at Walnut Creek, our team and prosthodontists, Dr. Keith and Dr. Gibbs, are happy to discuss your options and help you choose a treatment plan that is right for you. When considering your options between having your dentures retained with implants or not, for most seniors, cost is frequently the first concern. Though there is more initial cost to have your implants surgically implanted, the long term savings may surprise you. With implant supported dentures, there will be no adhesives to buy because there is no shifting, wobbling, or looseness. You will never need to have your denture realigned, because there will be less bone shrinkage and because the denture is not relying on the ridge to hold it in place. There will be fewer office visits for readjustments or to discuss soreness, because there shouldn't be any. Overall, the costs may end up being fairly equivalent, and the comfort will be significant. Our team is happy to show you the difference. Using dental implants, we are able to firmly support your denture, while still allowing you to remove it for cleaning. With the insertion of 2-4 implants directly into your jawbone, your denture is firmly clasped into place, and can be unclasped for cleaning when needed. This allows the patient to wear their denture prosthetic confidently without worry of loose dentures shifting. Patients who have their denture appliance retained with the assistance of implants find that they are much more comfortable and are able to use their teeth to eat and speak much more naturally. In some situations, we may recommend a bar attachment denture. This appliance uses 4 dental implants supported by a rigid horseshoe shaped bar in either the lower or upper jaw to support a customized set of false teeth. 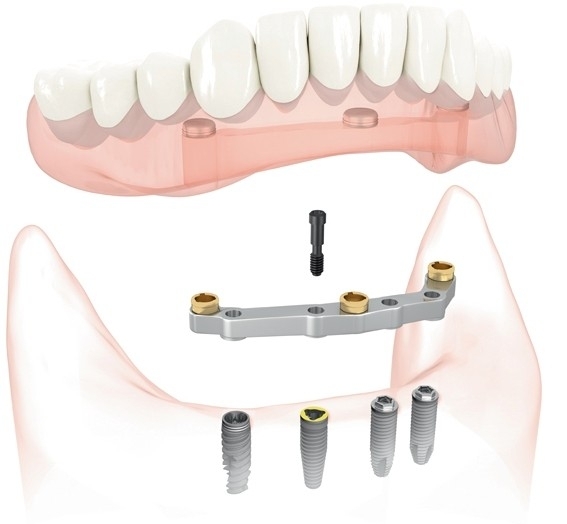 In most instances, an upper denture covers some or all of the upper palate, or roof of the patient's mouth, something that is generally considered uncomfortable to the wearer, the bar design eliminates the need for the denture to cover the palate. Why Should I Have Retained Dentures? • The denture is held firmly in place. They will not shift or become loose in your mouth. • By being clasped onto the bar, there is less shifting and movement, decreasing soreness, which is a common complaint for patients with adhesive held dentures. • Patients find that they have more freedom of function. There is not need to adjust the foods you eat. • Patients find that implant retained dentures are much more comfortable, much closer to their own natural teeth in movement and function. Our team, including Dr. Keith and Dr. Gibbs are here to answer your questions. Contact our front office at Dental Implant Center at Walnut Creek at (925) 266-3550.